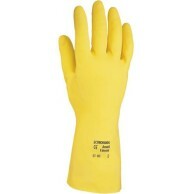 A premium nitrile glove, providing good standards of safety for high risk chemical handling. Each glove individually air pressure tested. Flock-lined. Other sizes may be available on request. Colour	Red Size	7, 8, 9, 10, 11 Length	380mm Unit	Pair Conforms to EN 388 and EN 374 Complex Design EN388 Test Result: 4103 If you have and queries please contact us. 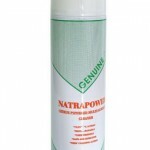 An innovative nitrile compound used in the manufacture of these gloves, which boasts of exceptional chemical and mechanical properties, the wearer can enjoy unmatched comfort and dexterity. 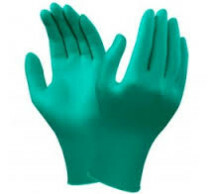 These gloves have exceptional puncture resistance properties, three times that of latex or PVC disposables. With a 100% Nitrile composition, and the absence of waxes, silicone or plasticizers, they reduce the wearer’s risk of being affected by Type I allergy due to Natural Rubber Latex. Appreciated for their textured finish, these gloves offer an improved grip, which is especially helpful for lab applications.